AUBURN, Ala. (AP) — Gene Chizik led Auburn to perhaps the greatest season in the program's history, and two years later to maybe its worst. The rapid fall from a national championship to 3-9 and the Southeastern Conference doormat led to Chizik's firing Sunday, the day after a humbling 49-0 loss to No. 2 Alabama that showed just how far the program has slipped. The Tigers endured the worst slide within two years of winning a national championship of any team since the Associated Press poll started in 1936 and hadn't lost this many games since going 0-10 in 1950. The decision came 17 months after Auburn gave Chizik a contract worth some $3.5 million annually through 2015 with a hefty buyout. Auburn athletic director Jay Jacobs said he informed Chizik Saturday night that he would recommend to President Jay Gogue the next morning that Chizik not be retained. He said he had concerns with lopsided losses in 2011 but grew "very concerned in our fundamental approach to the game" after the Arkansas game. "I had hoped our team would show some improvement this season," Jacobs said. "Unfortunately it didn't. The competition in our league is fierce. I decided we could not risk falling further behind by waiting for another year and hoping for improvement." The players were informed in a team meeting Sunday. "I'm extremely disappointed with the way this season turned out and I apologize to the Auburn family and our team for what they have had to endure," Chizik said in a statement released by Auburn. "In my 27 years of coaching, I have gained an understanding of the high expectations in this profession. When expectations are not met, I understand changes must be made." The Tigers went from 14-0 with a perfect SEC record with Cam Newton leading the offense in 2010 to 3-9 and 0-8, losing their final three league games by a combined 150-21. 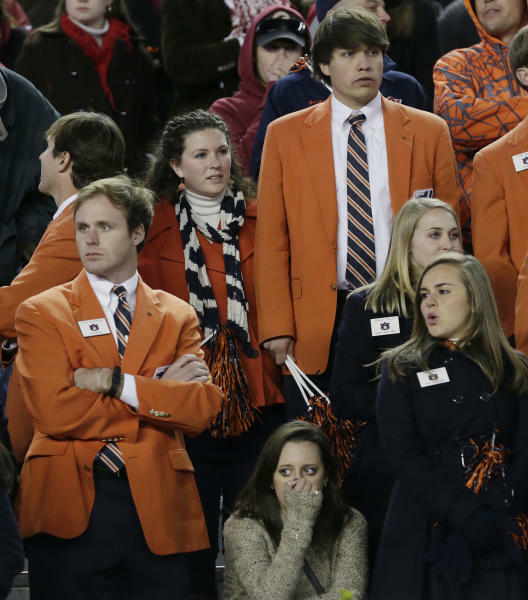 Auburn was blown out by Texas A&M (63-21) and Georgia (38-0) but the finale was even more painful for Tigers fans. The Crimson Tide cruised to a six-touchdown halftime lead and the second-most lopsided Iron Bowl victory in history, behind only the Tide's 55-0 win in 1948. "While we experienced a tremendous low in 2012, I will always be proud of the incredible highs that we achieved, including three bowl victories, an SEC championship and a national championship," Chizik said. He was 33-19 in four seasons and 15-17 in SEC games. 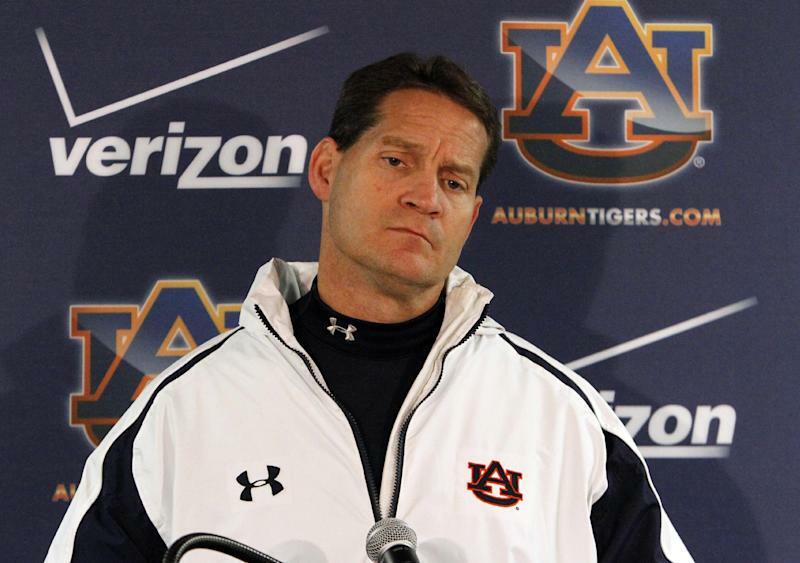 Auburn said the total buyout for Chizik and his assistant coaches is $11.09 million. Chizik's buyout is expected to total $7.5 million and will be paid in monthly installments for the next four years. Six assistants are under contract through June 30, 2013 while defensive coordinator Brian VanGorder, offensive coordinator Scot Loeffler and wide receivers coach Trooper Taylor have deals extending another year beyond that. The buyouts could be reduced if the coaches find other jobs. Auburn joins Arkansas, Tennessee and Kentucky as SEC teams with job openings showing the huge divide in a league with six teams ranked in the Top 11. Auburn tight end Philip Lutzenkirchen said players gave Chizik a warm ovation after the team meeting. "I think we did what he deserved and we gave him a standing ovation and clapped for him," he said. "There's so much love for coach Chizik on this team. Would we have loved to see him get another year, another opportunity? Yes, but at the same time we understand where Jay Jacobs is coming from. Three wins isn't going to cut it in our league." Defensive tackle Jeff Whitaker said, "It's kind of crazy right now. I had a special bond with Coach Chizik." Chizik inserted tailback Tre Mason on the final play against Alabama to get him to 1,000 yards. The next day, Mason saw his coach get fired. "It was a rough day for everybody," Mason said. "It's tough. There are going to be a lot of tears shed because there are a lot of relationships that may be put on hold or come to an end today. I have nothing negative to say about coach Chizik. He's done a lot for me and this program. I wish him the best of luck in his future." Chizik had sandwiched two 8-5 seasons around the national title, but never approached the success of 2010, when Newton won the Heisman Trophy. The Tigers were 7-17 in SEC games outside of 2010 during his tenure. His hiring was criticized by some fans after Chizik went 5-19 in two seasons at Iowa State and lost the last 10 games of his first head coaching job. Jacobs was heckled at the airport after making the hire. 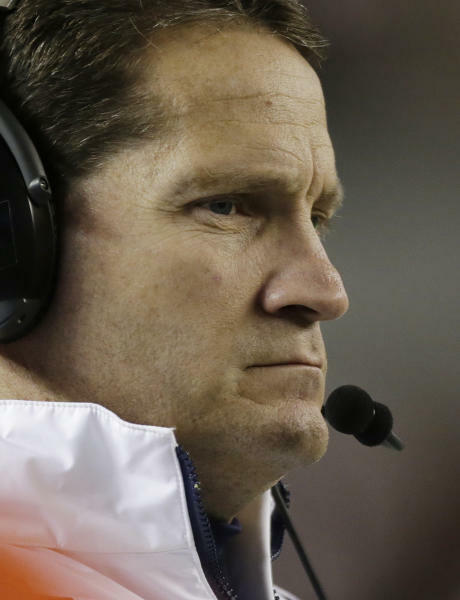 Chizik had been defensive coordinator on unbeaten teams at Auburn and Texas. A search committee comprised of former Heisman Trophy winners Pat Sullivan and Bo Jackson and former Tigers fullback Mac Crawford will assist Jacobs, the school said. Jacobs said he wants a proven winner — not necessarily an experienced head coach — who follows the rules and stresses academics. A transition year in 2012 might have been expected. Chizik had to replace the offensive and defensive coordinators after last season. Chizik made an ill-fated switch from Gus Malzahn's no-huddle, spread offense to a pro-style system with the hiring of former Temple offensive coordinator Scot Loeffler. The Tigers struggled in the transition, partly because of shaky quarterback play and ended the season with freshman Jonathan Wallace under center. Auburn ranked at or near the bottom of the SEC in every major statistical category offensively and defensively. Chizik's tenure was marred by off-the-field problems, too, to the extent that he had employees of a private firm run curfew checks on players this season. Four members of the 2010 national championship team were arrested on robbery charges in March 2011. Antonio Goodwin was convicted in April and sentenced to 15 years in prison. Dakota Mosley, Michael McNeil and Shaun Kitchens are awaiting trial. Two-time 1,000-yard rusher Mike Dyer transferred to Arkansas State with Malzahn after being indefinitely suspended before the bowl game. Freshman quarterback Zeke Pike was arrested in June for public intoxication and later dismissed from the team. Starting center Reese Dismukes was suspended for the opener against Clemson following a public intoxication arrest. Auburn is also the subject of an NCAA investigation that includes the recruitment of Memphis running back Jovon Robinson, who was ruled ineligible after a guidance counselor admitted to creating a fake transcript. Chizik's contract includes a clause that it wouldn't owe the buyout money if he is fired for cause, including findings of major rules violations or significant or repetitive violations" involving him or his program. Chizik and Auburn have weathered past NCAA scrutiny. The governing body closed investigations into the recruitment of Newton and allegations from four former players that they were paid thousands of dollars during their college careers. "I've got the utmost confidence in our NCAA compliance," Jacobs said. "Basically it boils down to winning and losing. Winning three games is unacceptable."